It is with great pleasure I extend a warm welcome to Hon. Julie Bishop, Minister of Foreign Affairs of Australia to Sri Lanka. The visit is significant, since it coincides with the 70th anniversary of the establishment of diplomatic relations between Sri Lanka and Australia. The people to people links are the bedrock of the bilateral relations between Sri Lanka and Australia. The presence of over 150,000 Australians of Sri Lankan origin has provided a human bridge between the two countries. The year of 70th Anniversary of our diplomatic relations have generated a new momentum in our longstanding relations with a series of recent high level visits. H.E. President Maithripala Sirisena undertook a State visit and Hon. Prime Minister Ranil Wickremesinghe undertook an official visit to Australia this year. The fruitful outcomes of these visits would serve as a roadmap for our cooperation in the years ahead. 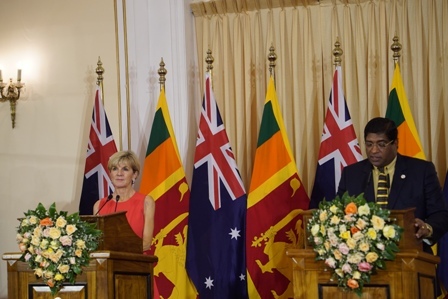 Foreign Minister Julie Bishop and I just concluded productive discussions on ways and means of further enhancing our bilateral cooperation in areas of mutual interest, including economic partnership, development cooperation, combating people smuggling, education and skill development, tourism, reconciliation and the role by Overseas Sri Lankans in the development of Sri Lanka. We also discussed on regional security challenges including maritime security as well as cooperation in the multilateral fora. Sri Lanka’s economic ties with Australia have now transformed itself into a dynamic partnership due to growing trade, investment, and new business interests. I extend an invitation to Australian investors to take full advantage of Sri Lanka transforming itself into an important and viable logistical hub in the East-West maritime arc. I expressed my deep appreciation for Australian development assistance received for several decades including under the Colombo Plan. Sri Lanka is also thankful for the opportunities awarded for post graduate studies to Sri Lankan public officials through Australia Awards which is coming under the purview of Hon. Foreign Minister Julie Bishop. We also discussed on enhancing cooperation in Technical and Vocational Education and Training to empower younger Sri Lankans. Foreign Minister Julie Bishop and I discussed on promotion of tourism between the two countries. I welcomed Australia’s assistance in the planning and development of the Sri Lanka tourism industry. We explored opportunities to collaborate in promoting eco-tourism and community based tourism. I am pleased to inform that Sri Lankan airlines will commence its operations to Melbourne with effect from October winter 2017. I take this opportunity to express my appreciation to Foreign Minister Julie Bishop for her keen interest in reaching out to Sri Lankan Australians and encouraging them to work with the Government of Sri Lanka towards common objectives. Sri Lanka continues to encourage overseas Sri Lankans to contribute to Sri Lanka’s economic development. Strengthening of the Sri Lankan economy and inclusive growth are important factors for ensuring long-term peace, stability, and non-recurrence of conflict. It is a happy coincidence that Foreign Minister of Singapore Vivian Balakrishnan and Foreign Minister Julie Bishop are visiting Sri Lanka at the same time. I am glad to inform that we have made use of this opportunity to meet together tomorrow to discuss on issues of common interest. Foreign Minister Julie Bishop will pay courtesy calls on President Maithripala Sirisena and Prime Minister Ranil Wickremesinghe tomorrow. Sri Lanka values the longstanding friendship and cooperation with Australia. I am confident that the visit of Foreign Minister Julie Bishop will further enhance our warm and friendly relations and serve as a catalyst to expand our partnership in multifaceted areas in the years ahead. I wish Minister Julie Bishop and her delegation a very pleasant stay in Sri Lanka.